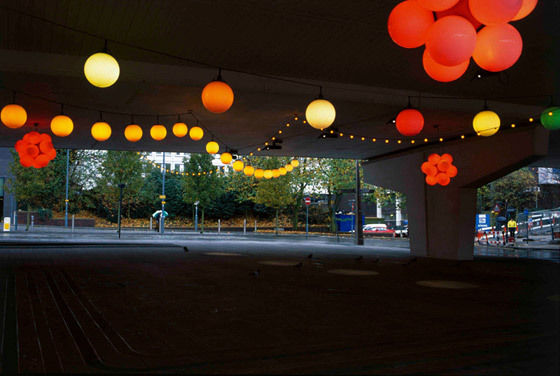 "When I look at it now, I don’t know what it is," says artist Mark Pimlott of his recently completed installation Guinguette, set beneath a flyover on the edge of Birmingham’s city centre. This report was previously published in Sculpture magazine, 20(9), (2001) page 18. Birmingham Mailbox light sculpture: Mark Pimlott, Guingette (detail), 2000. 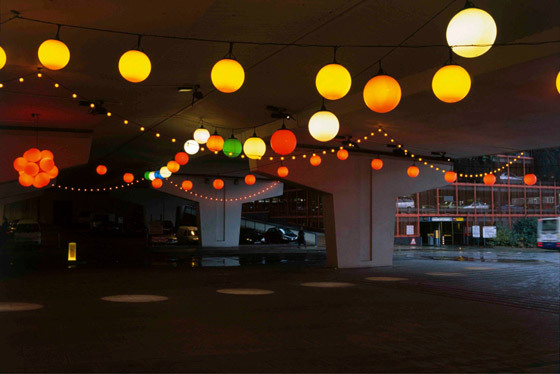 Zenon-filled lamps, compact fluorescent lamps, acrylic/ polycarbonate globes, proprietary fittings, and cabling, overall site 54 x 34 x 4.4–6.2 meters. Mark Pimlott was commissioned by the owners of the Birmingham Mailbox building to design an intervention linking the new retail, office, hotel, and residential complex with the downtown— spatially separated by the flyover. “It seems to me like an art installation which could very easily be confused with being a design. It looks to me exactly how I though it would be— a dream,” explains the Canadian-born, London-based artist-designer. Trained as an architect at Montreal’s McGill University and the Architectural Association in London, Mark Pimlott also received an MA in Visual Art from London’s Goldsmiths College in 1992. The Mailbox, Birmingham light sculpture: Mark Pimlott, Guingette (detail), 2000. Mark Pimlott relied on a 19th-century Parisian model of the “guinguette,” a kind of club that existed on the perimeters of Paris just outside the legislative boundaries of the city— “lawless” places used for “entertainment and joy.” Pimlott decided to transplant the idea and “just invert it, from a negative into the ridiculously positive.” Throughout the day, more and more lights are turned on, climaxing in the evening when the lights are on full throttle. Lighting dominates the intervention, and studio Mark Pimlott designed the arrangement of luminaires and projectors, as well as the larger fittings which were manufactured by lighting contractors. 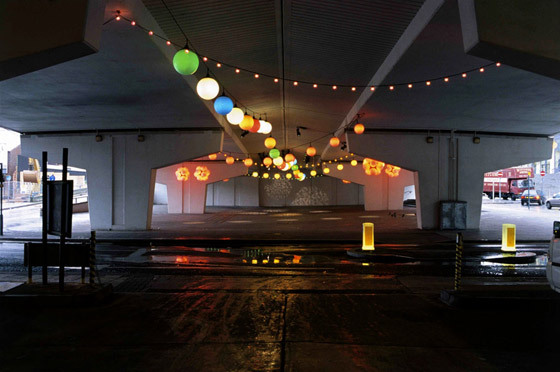 Pimlott arranged the lights with different scales and optical effects, in order to manipulate depth perception. He perceives the color selections as being “like a painting of beads.” For Pimlott, Guinguette is both a very precise urban gesture and “something childlike.” In fact, during a recent daytime viewing, the younger audience was enamored. 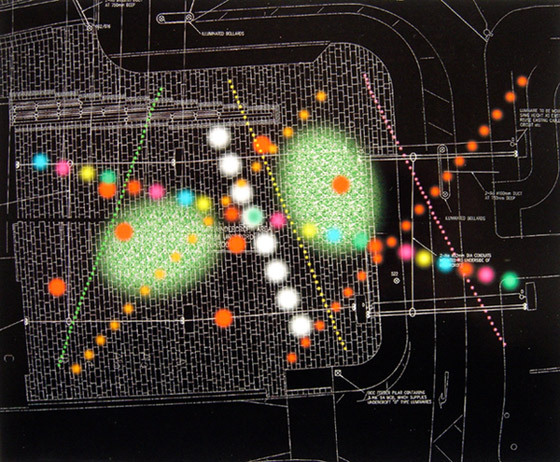 Mailbox building, Birmingham light sculpture illustration (ground plan) by Mark Pimlott. Mark Pimlott has exhibited his work at the Todd Gallery and Anthony Reynolds Gallery in London, as well as in New York, Toronto, the Netherlands, Kiev, Cairo, and in other locations in the United Kingdom. On the design front, he was one of two Design Coordinators for Ian Schrager’s London hotels designed by Philippe Starck. Writing, photography, and film are also part of Pimlott’s practice.